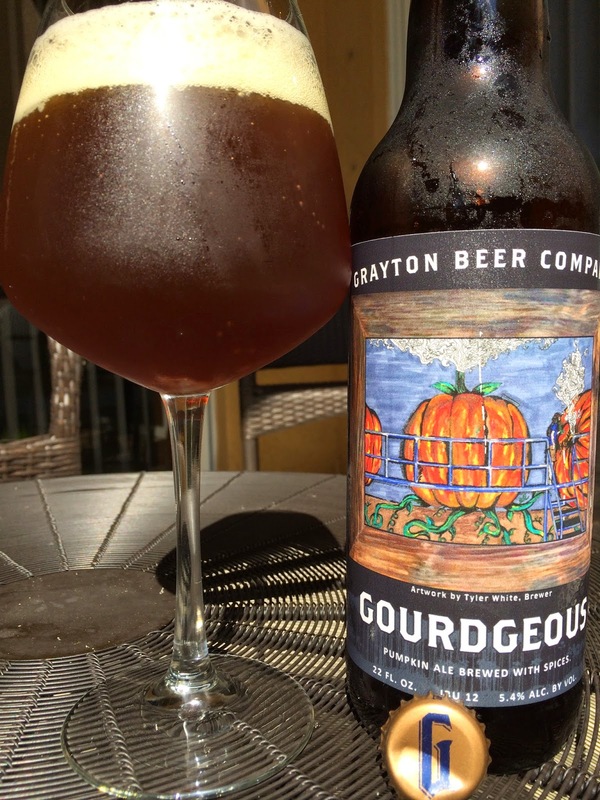 A Florida brewery I never heard of asked me if I'd like to check out their pumpkin beer named Gourdgeous. I can already hear a few of you laughing, expecting that I'd say "No Way!" But Grayton Beer Company from Santa Rosa Beach gave me a few reasons to say yes. Of course I have a soft spot for Florida beers, but this is the first beer that Grayton packaged in 22 ounce bottles. In addition, it's also the first beer in their new Artist Series where local artists will be given the chance to design the beer labels. That and I haven't had one pumpkin beer yet this year, so I need to cave in on that annually. The Artist Series artist for this label is Grayton Brewer Tyler White. He created a really awesome piece of work which shows three enormous pumpkins replacing the brewing vats. A brewer is actually tending to the beer on the scaffolding and letting out some steam from the pumpkin stems. Very fun concept. A portion of the beer's proceeds will go to art-based initiatives and local charities. 12 IBU. 5.4% alcohol. Oh, and I almost forgot that I got a hand-written note from Head Brewer "Shank" with the beer. Yeah! Shank! Nice aroma full of cinnamon, brown sugar and pumpkin. Spices big at the beginning but definitely not overdone. Cinnamon and ginger stand out for me. Great malty backdrop of brown sugar, maple and pumpkin. You will definitely taste the pumpkin though it's not super prominent, an issue if that is the reason you drink pumpkin beers. Not overly sweet and balanced enough, though the beer definitely leans malty. And though this beer didn't convert me to Mr. Pumpkin Beer Drinker, this was pretty good. If you like this style of beer, this will make you happy!